I know what you’re thinking. How can I be “Going Green for Ground Squirrels”? 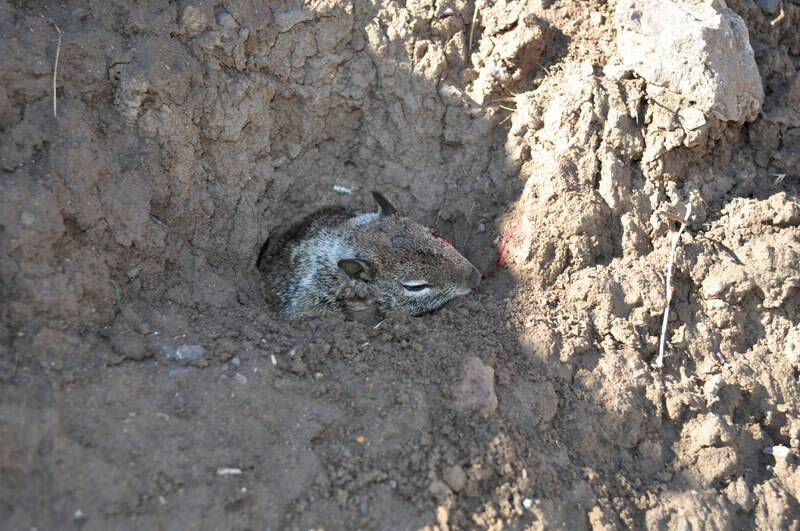 Other than rigging their dens with solar power, or getting them set-up in some miniature Prius’, there is not really a way that Ground Squirrels can “Go Green”. Now that you know what I’m talking about, let me tell you more about the Winchester .22 Long Rifle Lead-Free (26 grain TIN truncated hollow-point) Ammunition. 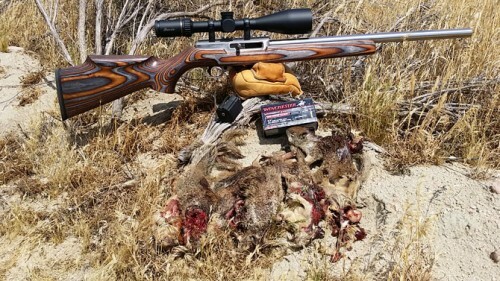 Back in 2008, while testing the CCI 22 Magnum TNT Green Ammunition, I discussed the change in the California law which allows only non-lead ammunition when hunting big game, predators and so-called varmints (ie: ground squirrels) in a specified area, now known as the “Condor Zone”. 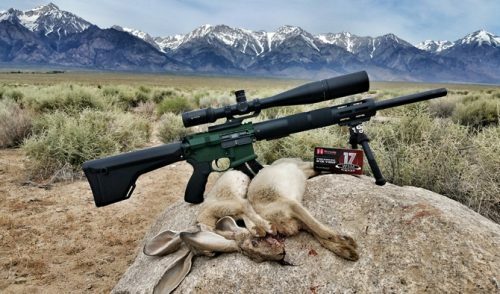 Until recently, thousands of California hunters had to shelve their .22 rifles and reach for other types of firearms to chase varmints in the Condor Zone. 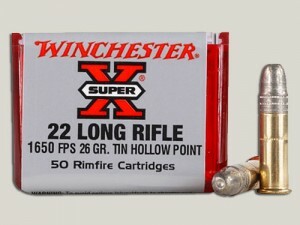 Winchester announced their .22 Long Rifle Lead Free Ammunition to great relief from many varmint hunters here in California. 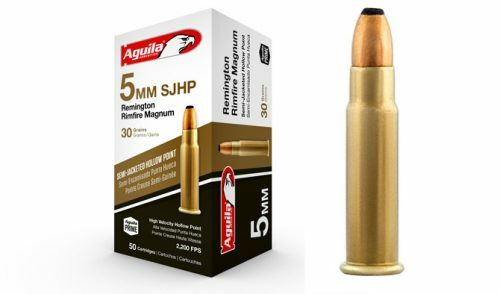 This ammunition is described as a 26 grain tin hollow point bullet, zipping along at 1650fps. My first reaction to reading how light the bullet is, was concern about bullet performance and accuracy out to 100+ yards. This was confirmed as I began shooting the ammunition a few months ago. My groups at 50 yards were okay, 75 yards were so-so, 100 yards got me worried. 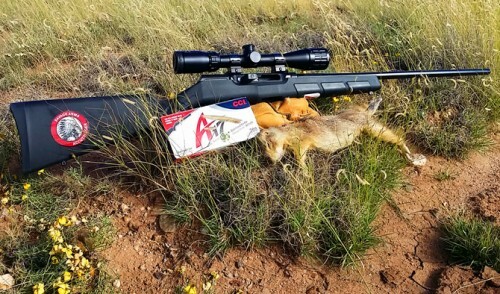 I’m lucky, because most of my shots for ground squirrels are within 75 yards, but it bothered me that I couldn’t reliably make any long shots. This issue seemed to be experienced by other shooters, with different rifles and conditions. The video below was taken back in March, 2010, but was on a windy day. I was able to shoot better groups since, but they improved only slightly. 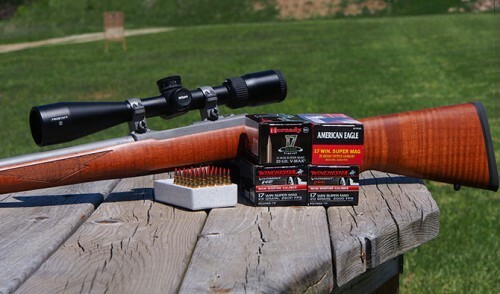 The group on the video was shot with a Ruger 10/22 with a Green Mountain sporter contour, fluted barrel topped by a Leupold Vari-X III 3×9 scope. This rifle is very accurate with the right ammunition (ie: CCI Velocitor), but the results from the Winchester Lead Free were not up to my standards. But, that doesn’t mean I didn’t try it out on some varmints! If it seems like I only have bad things to say about the only Lead Free 22 Long Rifle ammunition available here in the USA, let me touch on some of the good experiences I had with it. As you can see in the first video, the ammunition performed well within 75 yards. 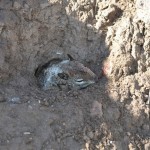 A ground squirrel head, peeking out of a small hole on the side of a ravine, makes for a very small target. More than once I was able to put my crosshairs on an eyeball and kill it instantly. Another positive was the bullet energy when hitting a “hard target”. I put that in quotes so you understand what I mean by hard target. Most of the lead free ammunition tends to be harder than lead. This tin ammuntion is no different. 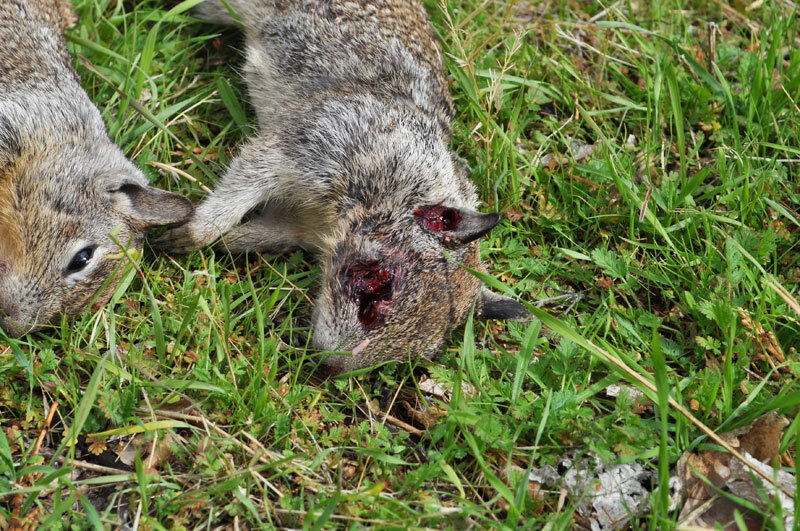 However, when you hit a medium sized ground squirrel in the head or shoulder area, you will definitely hear a “crack” if the bullet hits any bone. 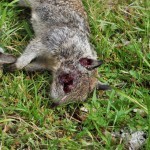 Almost all of the hits shown in the video above passed completely through the ground squirrel. This was the case even when they were hit in the head. I had to dispatch a skunk at my buddy’s house up in the high desert. The skunk had an issue, as it walked up to the house in the middle of the day, bent on getting to the front porch, even with us using a hose and yelling to try and turn it. However, once the hose turned him back away from the house, my buddy asked me to dispatch it. I dropped it immediately with a shot to the shoulder at about 25 yards. It did not have a chance to spray and the bullet did not exit. It was very odd for the skunk to be so aggressive in the middle of the day, but the .22 took care of it. 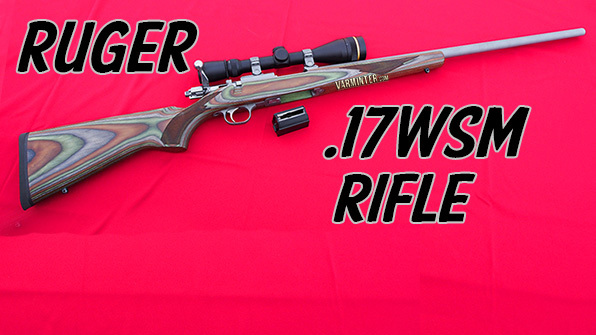 My final thoughts on the Winchester .22 Long Rifle Lead Free Ammunition is this. California hunters who live in the Condor Zone have no other choice of ammunition if they wish to shoot their .22 rifles. 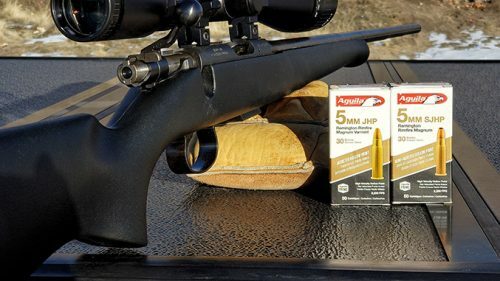 This ammunition is not perfect, but it is very difficult for rimfire ammunition manufacturers to produce a lead free alternative, with metals that are somewhat inexpensive, but have the same characteristics as lead. We saw that with shotgun ammunition when steel was first released and we will see it with rifle rounds. 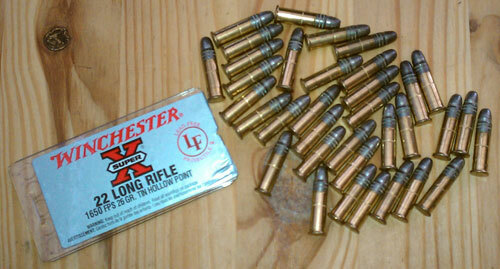 However, Winchester should be acknowleged as being on the cutting edge of lead free rimfire production. They haven’t hit it out of the ballpark with this particular offering, but if they continue to tweak this ammunition, they might have a winner. Otherwise, I fear that poor accuracy will equal poor sales. That will only mean the demise of this rare round. This article was originally published on November 3, 2010.